For users of the Fatigue Module, COMSOL Multiphysics® version 5.2a brings the new Dang-Van model, which is tailored for the quick and accurate modeling of compressive loads, contact fatigue, subsurface fatigue, and spalling. A number of new and extended tutorial models demonstrate applications of this new feature. Learn more about the Fatigue Module updates here. The stress-based fatigue model family has been extended to include the Dang-Van model. This new model incorporates the sensitivity of the compressive state into the fatigue prediction via hydrostatic stress. The Dang-Van model is therefore suitable for the evaluation of compressive loads and for contact fatigue. The model can predict subsurface fatigue development prior to spalling that is observed in, for example, bearing and rail applications. Subsurface fatigue in a surface-hardened material, evaluated based on the Dang-Van model. The Dang-Van model can be evaluated on entities in 1D, 2D, and 3D. Yet, when modeling subsurface fatigue, an evaluation on the 3D domain level is most suitable. The fatigue analysis can, however, become time consuming, since the highest stresses are usually located about 10-100 micrometers below the surface, and an accurate solution requires a fine discretization throughout the depth. Additionally, if the contact load is transferred along curved surfaces, a fine mesh is again required along the two surface dimensions. However, computations are easily parallelized and the evaluation time decreases when computing on multiple processors. Most of the fatigue model setting options have been parameterized. This means that parameters and variables can be assigned to fatigue model settings and their influence on fatigue can be evaluated in a parametric study. Only two options cannot be parameterized: the Number of mean value bins and Number of range bins in the Cumulative Damage feature. A parametric study of the stress factor used to modify the SN curve for different environmental and manufacturing conditions. A standing contact fatigue test is a procedure used for testing crack growth on the subsurface level. In such a test, a spherical object is pressed against the tested materials and cycled between a high and low compressive load. No translational movement between the two occurs. After a period of time, surface cracks can be observed on the flat object's surface, while further analysis of the component reveals multiple cracks that are present on the subsurface level. The surface is originally hardened, which changes the material properties of the surface in comparison to the material properties of the rest of the object. This surface hardening procedure affects the material strength, hardening, and fatigue properties of the object, while residual stresses are also introduced throughout the depth of the object. Three distinct layers of fatigue-affected material can be observed. Closest to the surface, the specimen has a strong case layer, while in the core, the material has unaffected material properties. In between these layers, there is a transition layer where both the material properties and the residual stress have strong gradients. All of these effects are incorporated in the simulation of the load cycle. 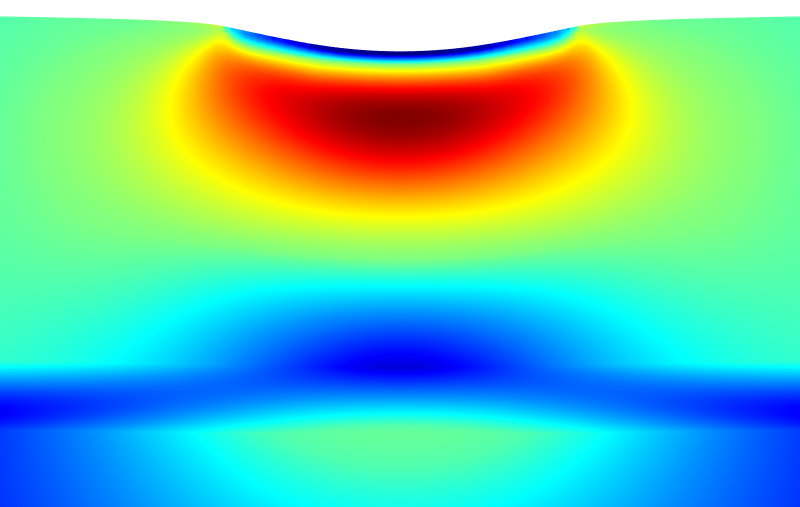 In this example, fatigue is simulated using the Dang-Van model. The results show stresses that are a combination of the residual state from the hardening process and the structural response to the plastic deformation arising from the indentation of the spherical object. Plasticity occurs only during the first load cycle, while subsequent load cycles are elastic in nature. The second load cycle can therefore be seen as a stable load cycle and is used in the subsequent fatigue study. The effective stress in a surface-hardened material at the peak load. The highest stresses are found just below the surface. There is also a local stress maximum at the interface between the transition layer and the core. When a linear guide is loaded above the manufacturer's specification limit, one concern is whether the contact loads will introduce fatigue spalling. In this system analysis, the entire guide has been analyzed and the mostly damaging contact load has been identified to occur on a rail raceway. Since spalling is initiated by a fatigue crack on the subsurface level, a fatigue evaluation based on the Dang-Van model is performed. The fatigue evaluation of a moving contact load on a curved surface requires a controlled mesh. The elements' sizes must be small enough to correctly resolve the contact pressure on the surface. And, as we are analyzing a rolling contact, the contact pressure is dynamic along the surface so that the entire area of the traveling contact must consist of small elements. 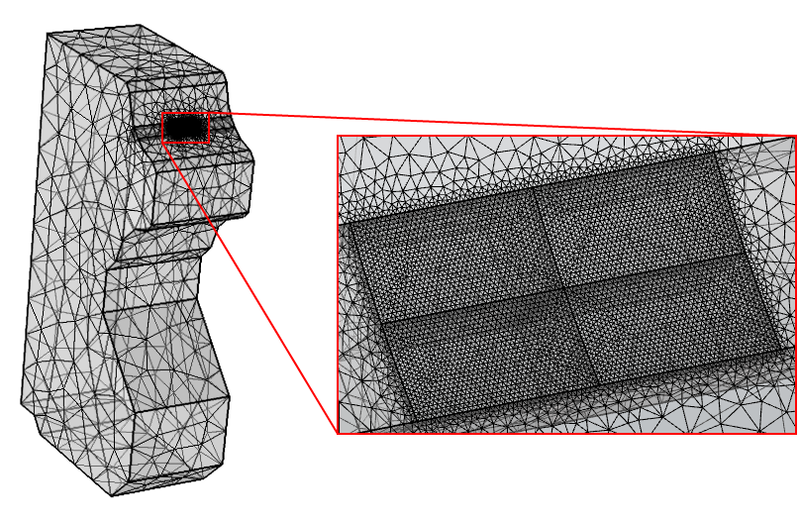 Moreover, the largest shear stresses in a contact analysis are found on the subsurface level, so that a fine mesh is also required throughout the depth of the model. A technique for handling such a challenge is demonstrated in this model. 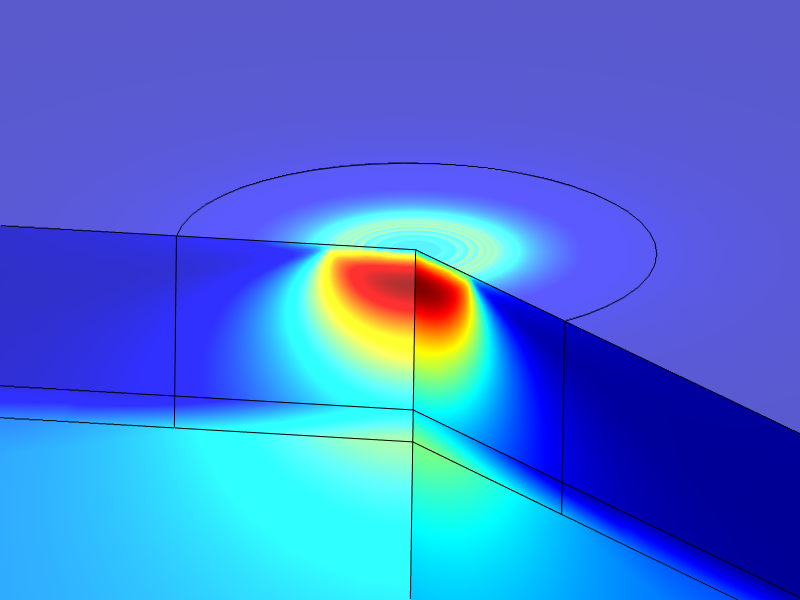 Mesh used in a simulation of a linear guide subjected to rolling contact fatigue. This tutorial model has been extended with the fatigue prediction based on the Dang-Van model. The results of the three stress-based models, Findley, Matake, and Dang-Van, are subsequently compared with each other and the differences are discussed in the documentation. 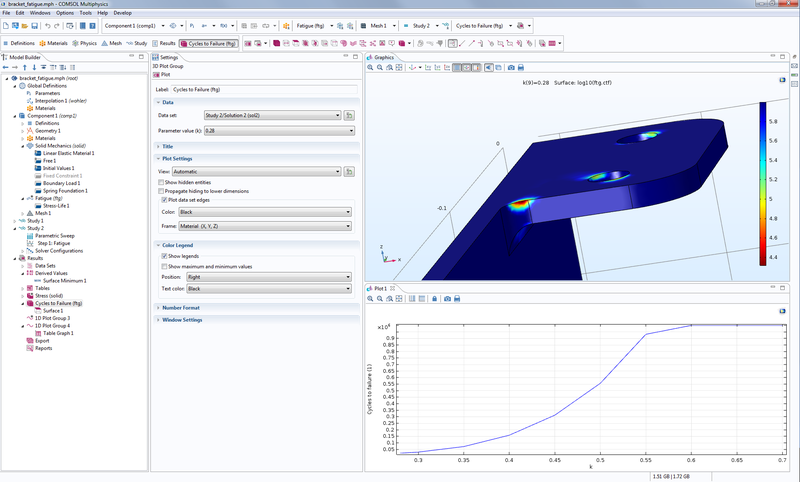 The Fatigue Evaluation of a Bracket tutorial model has been extended with a parametric study. The extension demonstrates, step-by-step, how to perform a parametric study of a fatigue analysis, which is a good starting point to learn how to use this feature.